piCture pOlish Blog Fest 2013 | Sahrish Adeel - Malaysia based Pakistani Beauty & Lifestyle Blogger! If you know piCture pOlish, you would know they have a blog fest every year. I was so honored to be a part of their Blog Fest 2012 which then resulted into Majesty - my precious. Without further ado, let's get into the details and finally my creation for this year's blog fest. This year piCture pOlish decided to select a over 130 bloggers and provide them with three shades to create a step-by-step nail art tutorial. If you are reading my blog for some time, you would know that neither am I a nail art expert nor I go ultra hectic on things related to beauty because I know not many of us get time to indulge into our hubbies. So this year, I bring you the easiest, time saving and versatile nail art. I am sure most of other bloggers will be publishing oh-my nail arts but since I am not even close to be called a nail artist, this is what I thought would be good for my readers. I was given Paradise, Mardi Gras & Coral Reef to create a nail art. To be honest, I instantly fell in love with Paradise & Mardi Gras and instead of Coral Reef, I wanted something aqua. But still I managed to pull something and let's see how I did it. Note: You will see the tutorial on a nail wheel and then the final result on my own nails. I tried to shoot it on my nails but that did not come out good enough. 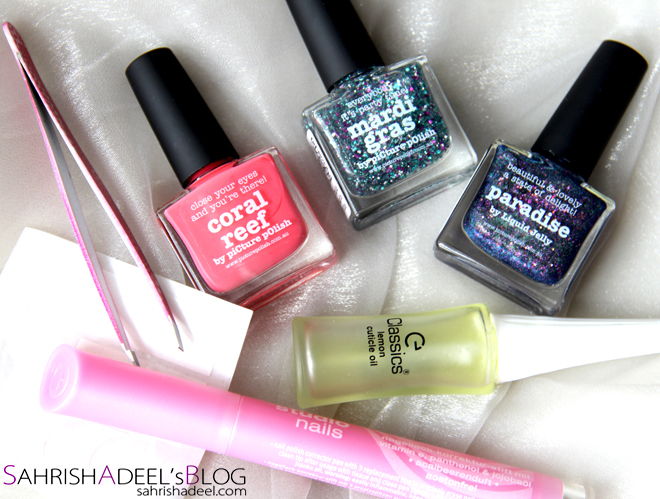 Nail polish shades in Paradise, Mardi Gras & Coral Reef - you can use any shades you would want to combine and if you want to skip using a glitter based top coat, I would recommend finishing your nail art off with a clear one. Nail guides - these are so inexpensive and easily available every where but if you cannot get your hands on these, you can use a tape or just about anything that you can stick and can be cut into your desired shape. Nail Polish Corrector Pen by Essence - a q-tip or a small brush dipped in nail polish remover will work good too. Cuticle Oil & a pair of tweezer - please skip these skips if you wish to. I applied one thick coat of Coral Reef as a base color and let it dry for about five minutes so it will get real hard. Then I used nail guides and placed in an angle on my ring finger and straight on tips on rest of my nails. Tweezer comes really handy here when you have nail polish on both of your hands. Also, it helps to push the nail guide on sides of the nails precisely. I applied one thick coat of Paradise and removed the nail guide while my coat was still wet. If you remove the nail guide after the polish has dried, it will leave an odd looking edge. Finally, I applied one thick coat of Mardi Gras and I am done. I wore this mani for over seven days and it did not chip. Mardi Gras is really good. I had fun creating this manicure and I would love to know what you think of it? Do leave your comments please. You can go to piCture pOlish's website to get these polishes for yourself. The ship worldwide and have amazing everyday deals. You can also find one of their network members in your country to shed off extra bucks from shipping cost. If you living in Malaysia, you can buy this shade from me too since I am piCture pOlish's network member from Malaysia now. Find more details on my blog shop page. Reviews on piCture pOlish polishes.